I’m not sure if some divine power of good — or most likely evil — took over after he posted it, but through some supernatural intervention, he was inspired to ask me for some analysis. A request for a critique? My tiny inner child jumped in pure excitement…before returning to the fetal position…and the crying. Karma must be on our side, and I must immediately do something to correct that. Rather than bust out the entire draft by teams to grade, I decided instead to take specific picks that I felt were reaches or steals to highlight. Of course, these reaches/steals are based on my esteemed opinion, and the Fools always hear that we all are entitled to one. Until we can demand licenses for them, I’m being kind and also taking into consideration that we are looking at things one month later here. I’m sure I’ll still screw up my karma somehow. While I figure Brady is going to be the first QB off the board this year, there are a few more stud RBs that I would try and grab before taking him with the 4th overall pick. Joseph Addai and Brian Westbrook are both still on the board here, so I think this pick qualifies as a bit of a reach. I don’t see Brady going until at least the 5-6th overall range since Peyton Manning, Tony Romo and even Drew Brees could be comparable in stats this year. Yes, Lewis was great last year, but he is also old. Old bones don’t hold up, and I don’t like him at 6th overall. I’d rather snag a Marion Barber over Lewis because he’s a RB in a potent offense who has less miles on the tires, and Barber is not a 6th overall talent either. The real value in this year’s draft going to be at the picks in the middle of the pack. RB studs will fall to them if people are too high on QBs. If Brian Westbrook was available at 7th overall, I would jump all over him. I see Westbrook as a top 3 talent — even with all his injuries. I’d take him over Steven Jackson. Pick 7, you just lucked out. I know. I used a hidden option C here to call Moss “questionable,” but I can’t really say he’s not worth the 8th overall pick. I can say that I don’t want to touch him this year. Moss is the primary target in one of the best offenses in football, but after the Giants showed how to break the system, will Moss get the same number of touches? I have to put my money on his age and improved defense cutting into his production this year, so I like him only outside of the first round. Clearly, that’s only my take though. Others might chance him in the first round. Gore is supposed to be the focal point of this new offense Mike Martz is putting together. With all the steam coming out of Martz’s head and pent up aggression from the way he left Detroit, I think he’s going to build some kind of mean monster in San Francisco. Gore should burst out of the gates in his 2006 form, and I see him as a stud for this year. He’s a top 10 pick in my opinion, so I have to disagree with The Hazean bumping him to the second round. P.S. In a snake draft, this team would now have Frank Gore and Peyton Manning. Not too bad a combo if you asked me. I must just be higher on RBs than The Hazean despite liking QBs this year, but I like Lynch in the first round this year. He’s an early second rounder at worst — hit-and-run incident aside. He’s got top 10 RB talent and an offense that will feed him the ball this year. I see him doing some big things. I might put him around the 10th overall range myself. How this accident of his shakes down could change that though. I loved Ryan Grant last year. Hey, I even like him a lot this year, but I think you take a high-powered receiver over him in the second round. Grant’s role in the offense is a little out there right now. Remember how many running backs Green Bay had last year? Well, now they are all back and healthy. He will be a good RB for your team, but I am not sure if he is dependable enough to be my RB2. Jamal Lewis and Ryan Grant in two rounds? That ‘s two questionable choices to carry your team this year. With the talent available, I don’t like these picks. There’s a lot of receivers flying around in this round. I am not sure I agree with Larry Fitzgerald as the second receiver taken since the QB situation could be shaky with beer-bonging Matt Leinart this year, but Reggie Wayne as the fourth receiver taken is a pretty nice snag. Wayne should be the clear No. 1 for Manning now that Marvin Harrison’s old knees and Bavarian pistols are catching up with him. I think Wayne and Braylon Edwards probably deserve a standing ahead of Fitz. Peyton Manning and Tom Brady both go in the first, but Tony Romo falls to almost the end of the second round? What a steal! Romo was the second highest scoring QB last season in some scoring systems. With T.O. returning and a more potent running game, he should have an even better offensive powerhouse this season. I would take him in front of Manning this year, so being able to snag him after having the second overall pick is a real win. How would you like your team to be Tony Romo and Adrian Peterson after two rounds? Yeah, that’s what I thought. Overall, I have to say that I like The Hazean’s mock. While there are a few questionable characters in there, the majority of the teams should be the start of something I might be willing to take home to introduce to the parents. The majority of my steals/reaches were only slight adjustments. I look forward to checking out his next updated mock, and until then, I’ll be trying to figure out how a man can be a haze. Rain or shine, feast or famine, storm or impending doom, fantasy football diehards love to mock draft. I’m definitely guilty of already plotting for one, but I dare not complete one before the NFL draft and a few more free agent moves have passed. Rather than do one for myself, I gathered together several that have taken place since the end of the 2007 season and analyzed a few interesting moves that are occurring in the projected 2008 drafts. Quarterbacks are taking a big jump in this draft since Tom Brady inflated his value like he inflated his ego in 2008. Is he the first quarterback to take? And when should you take him? The alternative could be the old, reliable other Manning, or is it? The New York Times’ fantasy football blog The Fifth Down ran a fantasy mock draft by Mark St. Amant (he’s book–learned) hot on the heels of the Super Bowl. The mock draft was broken down into Part 1 and Part 2. Of note, Amant’s top five was LaDainian Tomlinson, Brian Westbrook, Joseph Addai, Adrian Peterson and Tom Brady. The QB jumped just to the fifth spot. Peyton Manning popped up at 9, but Tony Romo merely got a mention in the “Best of the Rest” behind the likes of Randy Moss (at 12), Larry Johnson (at 10) and Clinton Portis (at 8). An interesting side note on Amant’s draft article stood out in Part 2 when he chose to avoid Edgerrin James, Greg Jennings, Fred Taylor, Reggie Bush, Roy Williams and Dwayne Bowe. Are you considering them for your draft? Each player comes with a reason to fear having them on your roster, but they will still be high on a lot of draft boards come preseason. Jennings isn’t doomed without Brett Favre and enters his third season uninjured–and you know what they say about third-year wide receivers. Roy Williams could recover in Detroit with a new coordinator, and Fred Taylor seems to never say quit. It might be a bit soon to dismiss them as avoidable. Fantasy Football Xtreme posted up an early mock draft in January. Xtreme stuck with L.T. at numero uno. Check out Randy Moss and Michael Turner breaking into the first round projections. This draft was posted when no one knew where Turner would end up, and his value is not likely worth a first round pick now that he has settled in Atlanta. Moss is an atypical pick in the first round. I might avoid him considering that he could get shut down more often now after seeing the New York Giants Super Bowl formula for beating the Patriots, but building around Moss could be a unique tactic for 2008. Tom Brady was selected sixth, but Peyton Manning and Tony Romo went in the second round. Those three were the only QBs taken. Two more made the four-round cut with Carson Palmer and Ben Roethlisberger going off the board at the end of the third round and beginning of the fourth. FantasyFootball.com jumped into the ring in February with a mock draft excluding rookies. [Link no longer available.] Jeff Williamson picked Adrian Peterson first–debatable at this point in the offseason after his inconsistent finish. The consensus top RBs followed in the mix, but Ryan Grant noticeably jumped into the eighth overall spot–not sure about that one, but more on that later. Quarterbacks didn’t show up until the second round when Brady went nineteenth overall. That’s much later than I feel a QB will go this year after the QBs really carried a lot of teams last season. It might be that the FantasyFootball.com guys just don’t feel building around a QB is a worthwhile strategy, but it seems strange that not a single one went for Brady until the middle of the second round if you look at the stats from the end of 2007. The Hazean posted his mock in mid-February with L.T. again leading and Tom Brady ranking sixth overall. Manning was eighth, and Tony Romo jumped in at 12. The Hazean’s placement of the QBs is a little more appropriate for 2008–not too high but not leaving them to the traditional second round grabs either. My only argument against his placement might be the order in which the QBs were taken since Romo might be a better value than Manning for 2008. NFL.com’s late March mock draft dove right off the deep end taking Tom Brady with the first overall pick, but at least Tony Romo and Peyton Manning made the cut for the first round as well. Frank Gore and Ryan Grant were slightly higher with NFL.com than I have seen them. Gore is supposed to be the center of the offense for the 49ers next season, but no one has seen Mike Martz’s playbook yet. As for Grant, the situation could get worse in Green Bay. The passing of the torch to Aaron Rodgers means Green Bay has a questionable passing game for at least the early part of 2008, and opponents could stack the box against Grant. The other concern is that one of Green Bay’s other running backs like Brandon Jackson or DeShawn Wynn will have an opportunity next season to share the load. Despite retirement, Favre strangely went 36th overall in NFL.com fantasy mock. Does NFL.com read their news section? CBS Sportsline is running a full 16 round draft that hasn’t finished up yet, but they are currently drafting the 12th round. Rookies are allowed, so McFadden went at 22 in the second round without even having a destination–that’s where these early mock drafts really get messy. CBS put L.T. first overall and dropped Adrian Peterson to third behind Brian Westbrook–another ranking choice that is debated in this offseason. The numbers support it though. Tom Brady came in tenth. Peyton Manning was actually taken before him at seventh overall, which I haven’t seen in most of these mocks. Old habits die hard, or maybe someone still has more faith in Manning’s ability to make a TD pass. Keeping an eye on Ryan Grant, he was higher once again in the second round at fifteenth overall, but the real injustice was Tony Romo staying undrafted into the third round and going at the 33 spot. The team that selected Romo got to take two RB studs first with Willis McGahee and Clinton Portis. With Portis projected to be more productive than he has been in 2008, those three could be a pretty lucky trio to acquire in the first three rounds. I pointed out fluke draft ranks for certain unknowns like Ryan Grant, Randy Moss and Frank Gore as I saw them, but a major trend throughout all these drafts was the changing value of the fantasy QB. I understand–and expect–the QBs coming in higher this season, but many of these early drafts seem to either take them with huge hype or ignore QBs following the traditional fantasy football drafting strategy. When it comes to drafting fantasy players, you have to look at the cold, hard stats. Tom Brady trumps all competitors because he put up the most TDs in 2007–50 if you don’t count the two he ran in himself. In standard-scoring leagues, Tom Brady was the highest point generator all season. He stands significantly above L.T. (18 TDs, 1 PTD) and would seemingly be the favorite for overall first pick in the draft. Even though he loses Donte Stallworth, he didn’t really utilize him in the offense. Jabar Gaffney is a sufficient replacement or possibly even better. Despite better coverage on Randy Moss, the New England running game is unpredictably utilized, and the Patriots will likely lean on the receiving again in 2008 as they did in 2007. Brady’s value should be higher than normal in 2008. There’s a valid argument that he shouldn’t go first overall because he is a QB and demand is not high enough to take a QB in the first round, but he certainly should be on the mind of drafters after the top tier of fantasy RBs are gone. Peyton Manning didn’t beat out all comers at the QB position last year as he usually does. Manning had 31 TDs passing and rushed in three. In most standard-scoring leagues, he ranked sixth overall at the end of the season–almost on par with Drew Brees, who will fetch a much lower price than Manning. 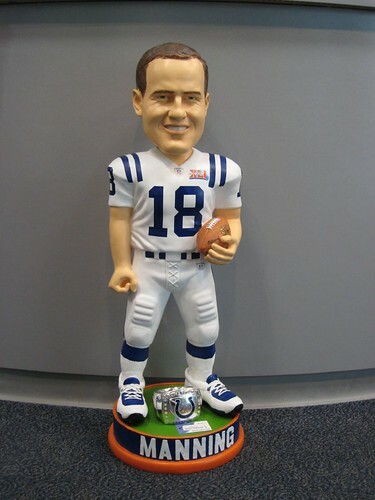 Manning will have all his weapons back to full health, but Marvin Harrison is becoming a shell of his former self. With Harrison in bad shape, Reggie Wayne can carry the load, but Manning just wasn’t as productive without Marvin Harrison in the lineup last season. I don’t think he can outclass Brady or Tony Romo in 2008. If anything, he can match either of the two. Tony Romo was forgotten on a lot of these mock drafts. He ranked third overall in total fantasy points in most standard-scoring leagues–right behind L.T. and Tom Brady. He put up 36 TDs through the air and 2 TDs rushing, and even though he was only slightly better than Peyton Manning in total points, Romo has his same offense returning for 2008 plus any rookies the Cowboys pick up the draft to improve upon the receiving corps. Romo wasn’t valued as high as he should have been last season, and a lot of teams were able to steal him in later rounds. After 2007, I think he has surpassed Peyton Manning as the second QB to be taken in the draft. In addition to just these three who seem to be going near the top of the QB pile in most mocks, a pack of QBs rounded out the top fantasy point totals in 2007. The top twelve point totals on offense includes eight QBs. Applying the final rankings directly to a mock draft wouldn’t make sense–especially for fantasy diehards–but good QBs should go higher this year. Brady, Romo and Manning will be expensive and likely go out in the first and second rounds while the rest of the high-scoring QBs–Brees, Roethlisberger, Hasselbeck, Anderson, Palmer–will go in the third round or later at a very nice bargain price because of consistency problems or neglect from fantasy owners. Last season showed us that a QB can be a team-changing value in fantasy football. I could see the first QB going off the boards as soon as fifth overall with the inconsistencies we have seen in our top RB studs in recent years. Brady and Romo definitely won’t be on the boards in most amateur drafts by mid-second round. This year’s draft will introduce a somewhat new QB-building strategy. Teams can 1) Take a highly-valued QB like Brady, Romo and Manning in the first round and build a team around him, 2) Take a RB first and look to pick up a top-tier or second-tier QB before the third round ends or 3) Try to snag as many studs at RB and WR as possible in early rounds and only taking a QB when they absolutely must–as in, before everyone starts drafting backup QBs. Building around a QB used to just apply to Peyton Manning, but it can’t anymore now that QBs have dominated fantasy point totals. Smart drafters may be able to pull a miracle and pick up a bargain like Matt Schaub or David Garrard in late rounds if they play their cards right and know their league mates’ tendencies well enough to take chances, but consistent stud QB play is a major advantage toward winning your league in 2008. I hope to see more movement of the QBs in the rankings as the fantasy drafts progress this offseason. More and more will likely carry Brady somewhere around the middle of the first round with other top QBs following close behind. The real question looking towards 2008 is how comfortable you feel about building around a top QB or staying the traditional route of taking a RB first. So how much are you willing to invest in fantasy QBs for 2008?